The tastiest burgers are cooked on a flat-top griddle or in a hot skillet. Unlike a grill, the fat doesn’t drip down into the fire below. Instead, it stays on the burger, keeping it moist. And the added plus of a griddle is that you get that wonderful char. 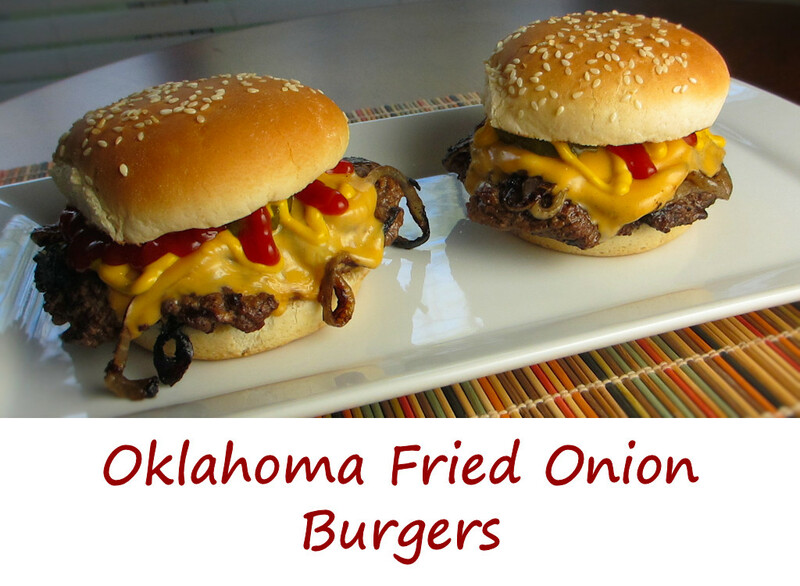 These Oklahoma fried onion burgers would be your standard fantastic griddle burgers, but they have a very tasty twist: onions that are griddled into the patties. The result is divine. I use a griddle insert that fits into my Weber charcoal and gas grills to griddle burgers like Oklahoma fried onion burgers. It not only gets super hot, it gets hot consistently across the entire griddle. This ensures that I get nice evenly cooked burgers no matter how many I am cooking at once. Also try my super-cheesy queso burgers. Place the onion slices in a large bowl. Toss with 1 teaspoon of salt and let rest for 30 minutes to extract as much liquid out of the onions as possible. Transfer the onions to a towel or a few sheets of paper towels, roll up tightly and squeeze to remove as much liquid as you can. Divide the onion slices into 4 equal piles on a cutting board or flat surface. Divide the beef into 4 patties and form into balls. Place beef on top of the onions and, using the palm of your hand or the bottom of a small skillet, flatten the beef into patties. The onions will stick to the bottom of the patties. That's what you want. Heat up a griddle or cast iron skillet on your stove top or grill over medium-high heat. Add the butter and swirl it around to coat the griddle or skillet. Add the patties, onion side down, and cook for 6-8 minutes. You'll see the onions starting to turn golden brown and get crispy around the sides. Flip and continue cooking until the burgers are done, about 2 more minutes. Top with cheese and remove. Add the patties, mayonnaise, mustard, and pickles.